As usual, the answer depends on the student. The simplest answer is that the lower your score, the more likely taking the test will raise it while the higher your score, the more likely taking the test will lower the scores. 55 percent of juniors taking the test improved their scores as seniors. 35 percent had score drops. 10 percent had no change. The higher a student’s scores as a junior, the more likely that student’s subsequent scores will drop. The lower the initial scores, the more likely the scores will go up. On average, juniors repeating the SAT as seniors improved their combined critical reading, mathematics, and writing scores by approximately 40 points. About 1 in 25 gained 100 or more points on critical reading or mathematics, and about 1 in 90 lost 100 or more points. You can view the actual retaking results by score Percentage of Students with Senior-Year Score Gain or Loss table. The ACT provides a summary of retesting results in the Summary Information for Retesting By Initial ACT Composite Score table. You did serious preparation for the SAT the first time you took it and had “good” test session. 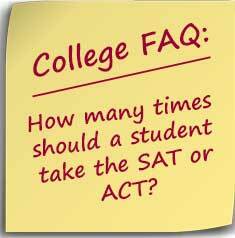 There is probably little to gain in taking the ACT or SAT again. You didn’t prepare for the test the first time and will spend the time to seriously prepare for the test next time. You didn’t have a “good” test session. This can include only getting four hours of sleep the night before, getting into a fender-bender on the way to the test site, not having the AC while taking the exam in June in South Texas… you get the picture. You are close to a score cut-off qualification. For example, if you can get your 550 SAT math score up to 600, you’ll qualify for a scholarship or some special program. If a student-athlete took the ACT test and has met the minimum qualifications with ACT and GPA for the NCAA and the school, can a student retest the ACT Test to raise her ACT test score so that additional academic money can be used? If a student-athlete took the ACT test and has met the minimum qualifications with ACT and GPA for the NCAA and the school, can a student retest the ACT Test to raise her ACT test score so that additional academic money can be used? Additionally, can this additional testing be done as a residual test on campus or does it have to be done at the National Test Date?